Hoppin Mad is a fun and exciting game that can be played by people of all ages. 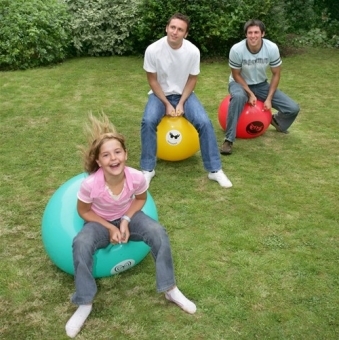 Based on the popular Space Hopper game, Hoppin Mad is the ideal racing game for any outdoor area. The hoppers that come in the Hoppin Mad pack have been given three names to add to the competitiveness; Daredevil, Psycho and Hotshot. Each pack contains 3 x 24inch hoppers, a foot pump and a start whistle. All components are packed within a colourful display box. Buy your indoor and outdoor garden games at Total Gardens. We stock all types of indoor and outdoor games at cheap prices. We are the largest retailer of garden games on the internet and specialise in giant garden games, large party games, giant Jenga games, giant connect 4 games, pub games, wedding party games, kids garden games, lawn garden games, croquet garden games, cheap garden games and many many more!